Gillies, H. (2010). Listening to the Learner: A Qualitative Investigation of Motivation for Embracing or Avoiding the Use of Self-Access Centres. Studies in Self-Access Learning Journal, 1 (3), 189-211. 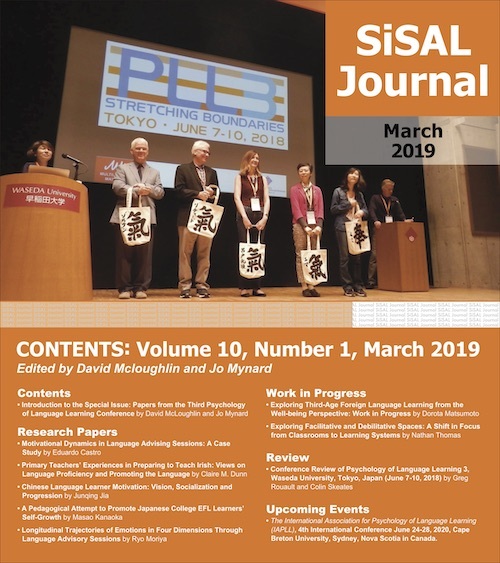 This paper reports on a follow-up study to Gillies (2007), in which a survey was conducted to investigate how tertiary-level Japanese EFL students understand and interpret their use or non-use of their institution’s self-access centre (SAC). The survey data revealed general trends regarding the factors which motivate the students’ use of the SAC as well as reasons why students choose not to use it, while also suggesting four types of students, via cluster analysis. Employing Dornyei’s (2005) L2 Motivational Self System as a theoretical framework, the current paper attempts to probe deeper into the survey data, and specifically tease out the factors influencing the use or non-use of the SAC. It reports on a set of semi-structured interviews with a purposeful sample of nine students from amongst the survey respondents. The interviewees included representatives of each of the four clusters identified in the survey data. The interview transcripts were then subjected to coding and labelling, and key themes in the data emerged: the SAC as an environment; the SAC as a community of selves; the SAC as contrasted with the classroom. Related to these themes, it was found that in the first year of university, identities are forged, distinguishing regular SAC users and rare SAC users. The SAC is an attractive environment for students with strong ideal L2 selves, while being uncomfortable for less confident students. The former type of student is more likely to see the classroom environment as restrictive, while the latter views it as sheltered and supportive. Meanwhile, the level of English proficiency is not in itself predictive of SAC use, but rather the level of L2 motivation, in particular the strength of the learner’s ideal L2 self. The paper discusses these themes and findings, and concludes with implications for the SAC, and suggestions for making the centre accessible and appealing to a wider cross-section of the overall student body. ‘Build it and they will come’ is a cliché often applied to the misconception that administrators sometimes have concerning the construction of new facilities. The reality is never so simple, and this applies just as much to the establishment of SACs, especially due to their usually non-compulsory use. In order to investigate this reality, the current research was conducted into the SAC of a medium-size private Japanese university. The published aim of this SAC is to foster autonomous learning (Cooker & Torpey, 2004). The SAC offers students access to a wide range of language learning resources, as well as training in how to employ those resources. However, an unpublished in-house survey of SAC users showed that the frequency of SAC usage was inverse to the number of years the users had spent at the university, and also that this usage tended to be limited to a small number of the centre’s facilities. Therefore, this study aims to discover what motivated students to start using the SAC, then why they choose to either continue using it, or stop using it. It also aimed to discern these motivations within Dornyei’s (2005) L2 Motivational System framework. As one might expect from such a complex phenomenon as motivation, inspection of the relevant research literature reveals a varied range of motivations amongst learners (mainly in tertiary level institutions) for embracing or avoiding the use of a self-access centre (SAC). Below are listed the main motivating factors for SAC usage (in no special order). One must also bear in mind that the authors are referring to a range of SAC contexts. Belief that self-access learning is a good way to learn, and effective for improving their English ability (Gillies, 2007; Gardner and Miller, 1997). A liking for the SAC environment (Gardner and Miller, 1997; Lai and Hamp-Lyons, 2001). Having the opportunity to speak in English, especially with native-English speakers (Gillies, 2007). Having the opportunity to enjoy various media, especially movies, for free (Gillies, 2007). Use-induced motivation to keep using the SAC, due to the autonomy-enhancing nature of the centre’s facilities (Cutting, 2004; Esch, 2004, cited by Pemberton, no date, cited by Milbourn, 2004). Course requirements to use the SAC (Dowling and Pierard, no date, cited by Milbourn, 2004; Heigham, quoted in TLT, 2004; Malcolm, 2004; Monk and Ozawa, 2002; Pemberton, no date, cited by Milbourn, 2004). Recommendation to use the SAC from teachers and friends (Gardner and Miller, 1997). Belief that use of a SAC does not help one’s English learning (Lai and Hamp-Lyons, 2001; Tamala, no date, cited by Milbourn, 2004). Lack of knowledge of how to use the SAC nor how use of the SAC can benefit them (Heigham, quoted in TLT, 2004; Jones, 2004). Aversion to the crowded nature of the centre (Gillies, 2007). Unwillingness to study by oneself (Chan et al., 2002), which may perhaps be combined with a difficulty to concentrate in a centre where students engage in group-based oral communication activities (Gillies, 2007). A preference for studying in other locations (Gillies, 2007). Cultural non-predisposition towards use of a SAC (Chan et al., 2002; Monk and Ozawa, 2002). Time-constraints limiting or preventing self-access learning (Chan et al., 2002; Malcolm, 2004; Pemberton, no date, cited by Milbourn, 2004). Such a range points to the multi-faceted role which a SAC tends to take on, serving its community of students in ways which may or may not have been originally envisaged. At the very least we can pick out not just educational, but also social, environmental, and leisure-related factors. But how can we tie this variety of factors, both positive and negative, together? What framework can best explain the situation? The learner’s vision of herself as an effective L2 speaker is termed her ideal L2 self, while the image which the learner perceives she ought to become due to social pressure (i.e., the expectations of significant others in her environment) is termed her ought-to L2 self. Motivation arises in the desire to reduce the discrepancy between the learner’s current self and either her ideal L2 self or her ought-to L2 self. The third component, termed the learning situation, recognises the situated nature of learning and the immediate ways in which variables in the situation impact the learning experience from a motivational perspective, either positively or negatively. The learner has a desired future self-image. The future self is sufficiently different from the current self. The future self-image is elaborate and vivid. The future self-image is perceived as plausible. The future self-image is not perceived as comfortably certain. The future self-image is in harmony – or at least does not clash – with the expectations of the learner’s family, peers and other elements of the social environment. The future self-image is regularly activated in the learner’s working self-concept. The future self-image is accompanied by relevant and effective procedural strategies that act as a roadmap towards the goal. A desired future self-image is offset by a counteracting feared possible self in the same domain. Now let us use these conditions to interpret the earlier list of factors influencing SAC use and non-use. If a student’s ideal L2 self is someone who lives and interacts in a foreign country, then SACs where students can meet and talk with native-speakers from that particular country or countries that share its native language, or where students can simply enjoy various media in the L2, allow that student to reduce the discrepancy between her current L2 self and her ideal L2 self. Such a student is likely to feel comfortable and motivated in that environment also because the SAC represents a group norm which is in harmony with this kind of student’s ideal L2 self. Moreover, this kind of SAC promotes the ideal L2 self in other ways: it acts as a primer for her future self-image, by reminding the learner of her ideal L2 self; it makes such a vision plausible by increasing the level of controllability experienced by the student, in ways that the classroom environment cannot; and it provides training in learning strategies to complement the imagery component of her ideal L2 self. On the other hand, a SAC user may be motivated by a strong ought-to L2 self. If for example her teacher or peers invite her to use the SAC, she may feel motivated to avoid displeasing these significant others. Once she has started using the SAC, positive experiences in that learning situation, primarily learning-related but perhaps also social, may further motivate her to continue using the facility. Likewise, the L2 Motivational Self framework can help us understand the reasons why students avoid SAC use. First, a student may simply not have a strong ideal L2 self which is sufficiently different from her current L2 self; or either her ideal L2 self or ought-to L2 self may be influenced by cultural norms which are divergent to her perception of the SAC norms, leading her to do her self-study in other locations, such as a library, or with a group of classmates with a common goal, rather than by herself (cf. Littlewood, 1999, regarding collectivist influences on Asian learners). Second, if a learner’s ideal L2 self conflicts with the group norms of her peers, this will hamper the learner’s drive to reduce the discrepancy between their current self and their ideal L2 self. Third, the learner’s ideal L2 self may lack clarity and vividness to drive the learner forward, or she may not possess the strategies to make progress towards her ideal L2 self through use of the SAC. Finally, practical features of the overall learning situation may conflict with the learner’s use of the SAC; for example time constraints, or the crowded nature of the centre. Clusters 1 & 2: These clusters differ only in terms of their level of English proficiency, cluster 1 being low proficiency, and cluster 2 being high proficiency. Otherwise, both clusters include: high-frequency SAC users; mainly female students; mainly first year students; highly motivated students with strong ideal L2 selves; motivations for SAC use: having fun, feeling immersed in an L2 environment, having the chance to use English, and a general desire for human interaction in their English learning; aversion to SAC use: time constraints. Cluster3: most representative sample; mid-to-high English proficiency; comparatively highly motivated to learn English; use the SAC almost once a week, mainly to improve their all-round English ability; motivated by the range of interaction available in the SAC, both human and material; aversion to SAC use: time constraints and social factors (e.g., lack of familiarity with English native-speaker teachers). Cluster 4: mainly male and third year students; low frequency of SAC use; lowest motivation for learning English, and the weakest ideal L2 selves; not so interested in the human interaction aspect of SAC use, instead placing more emphasis on the use of SAC materials and equipment; more likely to use the SAC as a course requirement; reasons for not using the SAC: time constraints, social/identity factors, and an apparent mismatch in learning styles, suggesting a different view of language learning compared with the other clusters. This emergence of four distinct learner self-types from the survey data led to a realisation that a quantitative approach was by itself unable to do justice to the increasingly apparent complexity of the situation. In other words, there was a need for delving deeper into the mindsets of the members of each self-type. Therefore a series of semi-structured interviews with representatives of each self-type was conducted, as the next section will outline. 1. The SAC as an environment: Why do some students embrace it while others avoid it? 2. The SAC as a community of selves: Why do some students feel included but not others? 3. The SAC as contrasted with the classroom: Why do some students embrace one and not the other? Based on the survey data from Gillies (2007), a purposeful sample of nine of the original questionnaire respondents took part in the interviews (see Appendix 1 for an outline of the questionnaire). In order to generate interesting data, strong opinions and attitudes, the students chosen included only very low or non- SAC users (six) and very high SAC users (three). Eight were majoring in English, while the ninth was a Chinese major studying English as a minor The gender balance was as follows: seven female, and two male – reflective of the overall ratio within the student body. As for the year of study, three were first year students, two were in their second year, and four in their third year. As for the style of the interview, following brief small-talk to help relax the interviewee, and a brief introduction outlining the purpose and content of the interview, it progressed in a semi-structured manner: certain ‘interesting’ responses to questionnaire items provided stimuli for eliciting of further details and underlying thinking in an open-ended manner. The interviews were conducted in either Japanese or English, or both, depending entirely on each interviewee’s preference – interestingly, the high SAC users all chose to speak in English, while the low or non- SAC users all chose to speak in Japanese. Each interview lasted between twenty and forty minutes, and was recorded for later transcription. Each interviewee was paid five hundred yen for their participation. The interviews were transcribed and analysed qualitatively. After an initial read-through, the researcher performed an initial coding, followed by development of node hierarchies, searching for interesting themes and patterns related to the overall research question: What are the motivations for students embracing or avoiding SAC use? The SAC as an Environment: Why Do Some Students Embrace It While Others Avoid It? As was found in Gillies (2007), the environment of the SAC turned out to be an important issue influencing the learners’ attitudes. Overall, the learners, whether regular or irregular SAC users, seem to see the conversation lounge as the focal point of the SAC (though officially it is separate from the SAC). This area is staffed by native-speaker English instructors from a range of countries. It is also made up of banks of sofas where students may eat and drink (unlike in the SAC proper). For some students it serves as a motivating force for their English learning, because they see it as offering the chance to be in an English speaking environment, and therefore reducing the discrepancy between their current L2 self and their ideal L2 self. Indeed, they liken being in this environment to being in a foreign country (see extracts 1A and 1B), which suggests the vividness of their ideal L2 self-image. For those who have had positive study abroad experiences it can even be a home-from-home. A2: Er. I think my favourite place in this university is SAC..like ELI- yellow sofa…Coz our class members always go there..and we have lunch there together..and we can speak in English there..and like we can speak with teachers, not only students..so we can- we- I feel that if I were there maybe I speak English every time..so it’s like I’m in the States, not in Japan…so I like the atmosphere of the SAC. S1: Compared with other places in the university, like other buildings, ELI teachers get together in SAC, so if I am in SAC I am surrounded by ELI teachers, so I feel I’m in English speaking countries..and also some TV programs in English are broadcasted. [Because of this the] SAC motivate me to study English more….the reason why I choose this university for studying is…I have a chance to study and to speak English and to communicate with English speaking- English people in person…so even I am in school in Japan I feel I am in English speaking countries like…feel like…….like I am studying overseas…even I’m in Japan. It would seem then that the learners in the above extracts, who are either in Cluster 1 or Cluster 2 and possess strong ideal L2 selves, perceive the SAC as affording authentic English use, in that there is a high concentration of native English speakers in that environment, both teachers and foreign exchange students. This is in contrast with the wider social environment in Japan where foreigners are scarce, and even the classroom environment where the learners mainly use English with fellow Japanese. Indeed, it is their strong Ideal L2 Self which drives these Clusters 1 and 2 learners to use the L2 beyond the confines of the classroom, a setting which may only emphasise their current L2 self: the L2 learner self, as opposed to the L2 user self. It should also be emphasised that the Cluster 1 student represents a type of student who is keen to use the SAC despite having relatively low English proficiency, suggesting that low proficiency is not predictive of SAC avoidance. Even not so frequent SAC-users, for example learner T (see extract 1C), seem to appreciate the ‘speaking’ environment of the SAC, as well as its ‘English speaking country’ feel. However, amongst other factors behind their low usage, for those learners who lack confidence in their English ability, especially for oral communication, that same environment can present a challenge to their confidence. In other words, despite their desire to make use of the environment, they may feel anxiety in what they perceive is a less scaffolded environment compared with the classroom. Indeed, learner T is assigned to Cluster 3, whose level of English Anxiety is relatively high. T3: The SAC has an atmosphere which lets us speak in English in a natural context and of course I like that, but when I don’t feel so confident about my English, the atmosphere can become restrictive. I like English, so I like that kind of atmosphere where communication flows naturally. But when I actually enter it, I really recognise I can’t speak English very well. So, I like the SAC but I don’t go there that often. The SAC as a Community of Selves: Why Do Some Students Feel Included but Not Others? As suggested by E’s testimony (see extract 2A), there seems to be a distinction, acknowledged amongst her Freshman peers, between those learners who use the SAC on a regular basis and those who barely visit it, especially of their own accord. Interestingly, this identification imposes itself relatively early on in the learners’ university career, and is reinforced by the increasing familiarity with the one group and increasing unfamiliarity with the other. Y(Assistant): You mean when they are Freshmen? E1: Yes. I have both classmates who go to SAC everyday and those who don’t go there at all. And I’m one of the latter. I mean, to go there now with [the regular users] and play games or something, when it’s already the second semester… I mean, if I went there more often earlier on, I might have also been able to say ‘Hi’ to teachers much easier, but now it’s not easy to go there now…I think those people who go there are very advanced and can speak English very well. But I can’t, so I guess that’s why I don’t go there. Learner E is found to be a member of Cluster 1, despite the fact that she hardly ever uses the SAC, as she herself admits in extract 2A. What places her in Cluster 1 is her optimal L2 motivation and high parental encouragement. She clearly lacks confidence in her English proficiency, and therefore lacks the confidence to use the SAC, self-assigning herself as a member of the SAC non-user group. In other words, she believes that the SAC is only accessible to those learners whose English ability is high enough. While this perception may be related to materials in the SAC and their self-accessibility, I believe it also relates to a view of the SAC as a venue for practising or using English, as opposed to specifically learning English. Indeed, learner E uses the expression ‘can speak English very well.’ This view then combines with the belief that one can only start using the L2 when one has completed learning it. K2: Because I think the students, who is… who are in the SAC, are very motivated so I can compete or be influenced, so… and quiet, and everyone is helpful, if I don’t- not sure the materials, so I can ask and learning adviser or SAC staff answer very politely. As was identified in Gillies (2007), familiarity with the native-speaker teachers and exchange students in the SAC (including the conversation lounge area) is a major factor determining frequency and type of use of the SAC. Applying a ‘community of practice’ framework (Lave & Wenger, 1991; Wenger, 1998) to this situation, we could identify these teachers and exchange students as core members from whom regular users learn. Investigating this further in the interviews revealed factors underlying this phenomenon. Learner S (see extract 2C) refers to the decreasing number of native-speaker teachers she is familiar with: this is a contextual issue, in that students receive less tuition from these teachers in their third and fourth years; furthermore, there is a high turnover of these teachers, due to their short-term employment contracts. S1: You know I’m a junior (i.e. third year student), so…. teachers I know are decreasing..so…it’s difficult to talk to them for me…if I know the teachers I feel easy to speak them…I know him or her well so I come up with topic in the conversation..if I don’t know them I may be in a kind of trouble..’what should I speak?’..so..I may feel nervous. The SAC as Contrasted with the Classroom: Why Do Some Students Embrace One and Not the Other? As mentioned earlier, two of the three published aims of the SAC are ‘to provide learners with a structured environment outside of the classroom,’ and ‘to support independent initiatives promoted in the classroom context’ (Cooker & Torpey, 2004, p.13). In other words, the SAC is intended to scaffold the students’ jump from classroom learning to independent learning, giving the SAC a complementary role in relation to classroom learning. However, the interview data suggests learners saw a contrast between the two learning environments. Learners with a strong ideal L2 self (Clusters 1 and 2) prefer the SAC over the classroom because there is more freedom of choice in the SAC. For example, Learner A (see extract 3A) can talk about whatever she likes in the conversation lounge. Meanwhile, for learners motivated by an ought-to L2 self, the constraints of the ‘classroom’ are embraced as shelter, safety, and freedom from responsibility (see extract 3B). This attitude may also be co-constructed by their perceived level of English proficiency, and therefore lack of self-confidence in language learning. A2: I feel more free to speak in English in the SAC..because..in the class we have some limit to talk in English..like the topic..we have to talk about the studying topic..not for just fun conversation..so I prefer speak in English more in SAC. R4: The SAC is where we go by ourselves, isn’t it, but in the classroom, the teacher prepares handouts, and the teacher will tell us what to do. So in that sense, it’s much easier. Therefore, the management of a self-access learning centre, functioning within an established institution with an established curriculum, and serving students whose learning history has featured non-autonomous influences, faces challenges if it seeks to give significant access and equal access to every kind of student. Helping these students make the necessary transition to greater learner autonomy, via the fostering of strong and elaborate ideal L2 selves, would appear to be a key objective in the Japanese context at least. Otherwise such a centre is only making itself useful to learners who are already independent, instead of also fostering independence in those learners who are still on their way to it. On the positive side, there is certainly evidence, from the original questionnaire data (cf. Gillies, 2007), that the students themselves recognise the value of self-access learning and wish to complete that journey, with most students displaying agreement with the statement that independent learning is an effective way of learning. As these findings show, there are ways in which SACs can embrace an even wider cross-section of the student community they serve – in other words, a wider range of L2 selves. First, both teaching staff and SAC staff can work to reduce the contrast between the classroom environment and the SAC environment: in other words, to develop a continuum from reactive to proactive autonomy, from ought-to L2 self to ideal L2 self, so that the learners who currently visit the SAC out of a sense of duty gradually begin to view that duty as contributing, in proximal concrete ways, to the realisation of their ideal L2 self. For example, short and achievable tasks using SAC resources could be incorporated into the classroom curriculum, giving the students an enjoyable and successful experience of using the SAC, which may then lead to more independent forays. Rose & Elliott (2010) illustrate this with the example of teachers requiring students to visit a SAC conversation lounge on a regular basis, resulting in a decrease in anxiety in talking with the native-speaker instructors there, and thus easing the way for those students to continue to do so independently. Second, the results of this study indicate a need to increase the effectiveness of the SAC in helping to develop its users’ ideal L2 selves in terms of their plausibility. This can be achieved by maximising the level of controllability experienced by students when they use the SAC resources, and helping them develop the practical strategies they need to complement their ideal L2 self-image component, so that they can make concrete progress towards realising their ideal L2 selves. In other words, the resources need to be more easily accessible to students who have recently graduated from a secondary level education system whose culture is vastly different from that of the SAC. For example, orientation sessions could be enhanced by greater L1 support, which would have the twin effects of making the SAC environment less uncomfortable for students with low self-confidence and ensuring that they fully understand what resources are available in the SAC as well as how to use them. In addition, SAC staff can be trained in customer-service techniques used in service industries, such as welcoming and saying goodbye to every visitor, remembering and addressing them by their names, and remembering their preferences for SAC use in order to be able to make personalised recommendations to them. Finally, the SAC could appeal more to those students who are mainly externally motivated towards language learning – in other words, students with strong ought-to L2 selves. For example, by establishing a classroom-based self-access course, the completion of such a course could become credit-bearing. However, the underlying aim of the course would again be to stimulate a shift in the students’ position along the continuum from extrinsically motivated towards intrinsically motivated – from ought-to L2 self towards ideal L2 self. While the above is a small selection of suggestions, the point is that SACs can and should make self-access learning seem both appealing and worthwhile to a broader range of learners by first recognizing the range of different L2 selves, with different future self-images, that make up the student community, and then ensuring they do not inadvertently restrict access to only certain types of learners, most usually confident learners with overseas experience and strong, vivid ideal L2 selves. This objective is especially pertinent to SACs since one of the main justifications for self-access learning, and by extension SACs, is that it can cater to individual differences amongst learners in a way that the classroom context cannot. Nevertheless, it is important to remind ourselves that we cannot expect a SAC to be able serve ‘all of the people, all of the time.’ Each individual student must have the right first of all to decide whether self-access learning, and the use of a SAC in the pursuit of that learning, can play a relevant role in the realization of their own unique future L2 self. Hamish Gillies is a lecturer at Bunkyo English Communication Centre, Hiroshima Bunkyo Women’s University. He has taught English in the Japanese university context for six years, having previously taught in the UK, China, and Australia. He is currently engaged in a PhD at Nottingham University, looking at the application of Complex Dynamic Systems Theory to language learning motivation, under the supervision of Prof. Zoltan Dornyei. Chan, V., Spratt, M., & Humphreys, G. (2002). Autonomous Language Learning: Hong Kong Students’ Attitudes and Behaviours. Evaluation and Research in Education, 16(1), 1-16. Cooker, L., & Torpey, M. (2004) From the Classroom to the Self-access Centre. The Language Teacher, 28(6), 11-16. Cutting, M. (2004). Making the transition to effective self-access listening. The Language Teacher, 28(6), 21-24. Csizér, K. & Dornyei, Z. (2005). The internal structure of language learning motivation and its relationship with language choice and learning effort. The Modern Language Journal, 89(1), 19-36. Csizér, K. and Kormos, J. (2009). Learning experiences, selves and motivated learning behaviour: A comparative analysis of structural models for Hungarian secondary and university learners of English. In Z. Dörnyei and E. Ushioda (eds), Motivation, Language Identity and the L2 Self. Bristol: Multilingual Matters: 98–119. Dörnyei, Z. & Ushioda, E. (in press). Teaching and Researching Motivation (2nd Edition). Harlow: Longman. Esch, E. (1994). Self-access, not self-service: Tesco versus Taylor’s. In Esch, E. (ed.) Self-Access and the Adult Language Learner. London: CILT: 63-67. Gardner, D., & Miller, L. (1997). A Study of Tertiary Level Self-access Facilities in Hong Kong. Hong Kong: ESEP, City University of Hong Kong. Gillies, H. (2007). SAL for everyone? 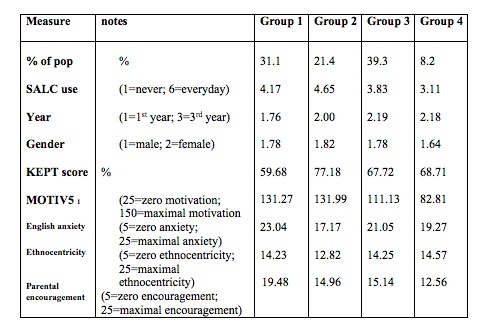 Motivation and demotivation in self-access Learning. Studies in Linguistics and Language Teaching, 18. Chiba: KUIS. Jones, J. (2004). Self-access language learning: More than just technology. The Language Teacher, 28(6), 25-26. Lai, L., & Hamp-Lyons, L. (2001). Different learning patterns in self-access. RELC Journal, 32(2), 63-79. Lave, J., & Wenger, E. (1991). Situated learning: Legitimate peripheral participation. Cambridge & New York: Cambridge University Press. MacIntyre, P.D., Mackinnon, S.P. and Clément, R. (2009b). Toward the development of a scale to assess possible selves as a source of language learning motivation. In Dörnyei, Z. and Ushioda, E. (eds), Motivation, Language Identity and the L2 Self. Bristol: Multilingual Matters: 193–214. Malcolm, D. (2004). Why should learners contribute to the self-access centre? ELT Journal, 58(4), 346-354. Milbourn, T. (2004). Supporting independent language learning in the 21st century. The Language Teacher, 28(6), 27-29. Monk, B., & Ozawa, K. (2002). Establishing a self-access center in a Japanese university. NUCB JLCC, 4(2), 49-58. Ryan, S. (Unpublished). The Ideal L2 Selves of Japanese Learners of English. Unpublished PhD thesis. Nottingham: University of Nottingham. Ryan, S. (2009). Self and identity in L2 motivation in Japan: The ideal L2 self and Japanese learners of English. In Dörnyei, Z. and Ushioda, E. (eds), Motivation, Language Identity and the L2 Self. Bristol: Multilingual Matters: 120–43. Taguchi, T., Magid, M. and Papi, M. (2009). The L2 Motivational Self System among Japanese, Chinese and Iranian learners of English: A comparative study. In Dörnyei, Z. and Ushioda, E. (eds), Motivation, Language Identity and the L2 Self. Bristol: Multilingual Matters: 66–97. TLT (2004). Starting up self-access: An interview with Juanita Heigham. The Language Teacher, 28(6), 17-19. The questionnaire consisted of six-point likert-scale multiple choice items divided between 5 main areas: L2 motivation, Purposes of SALC usage, Motivation behind SALC usage or non-usage, Attitudes towards the SALC, and Attitudes towards autonomous learning. The L2 motivation items covered the following factors: Ideal L2 Self, Instrumental motivation, Attitudes to learning English, Attitudes to the L2 culture, and Cultural interest. The purpose of SALC usage items included statements such as ‘To prepare for presentations’. The motivation behind SALC usage or non-usage items included statements such as ‘Because I can talk to English native speakers in the SALC’, and ‘Because I don’t have the time to use it’. The Attitudes towards the SALC items included statements such as ‘Using the SALC is effective in improving my English’. The Attitudes towards autonomous learning items included statements such as ‘Autonomous is a western way of learning’. There were also two individual items designed to discover the frequency of the students’ SALC use, of their own accord on the one hand, and as required to do so by their teachers. 1: a composite of the following factors: Ideal L2 Self, Instrumental motivation, Attitudes to learning English, Attitudes to the L2 culture, and Cultural interest. Based on Ryan (unpublished PhD thesis).